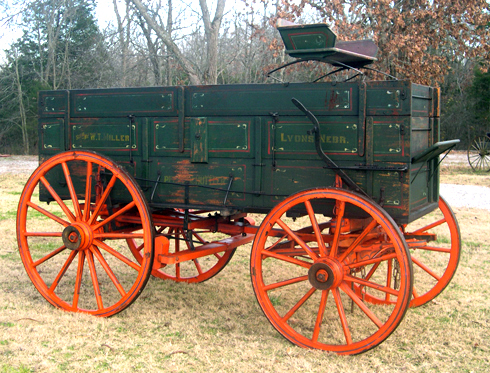 Of the tens of thousands of horse-drawn vehicle makers in the U.S. during the 19th and early 20th centuries, the Peter Schuttler Wagon Company was one of the most legendary. Steeped in Chicago history and America’s western lore, the roots of the company go back to 1843. From use on farms and ranches to freighting on the plains and hauling ore from western mines, Schuttler’s durability, craftsmanship, and attention to detail earned the company the pinnacle of brand loyalty and a highly enviable reputation during its eighty-plus years in Chicago. 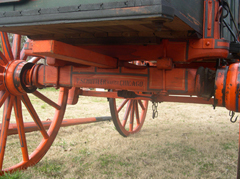 This high wheel Peter Schuttler “Chicago” wagon was originally sold by the W.T. Miller dealership in Lyons, Nebraska. 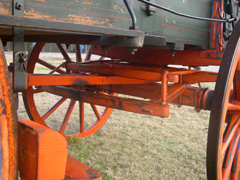 Rear wheel heights measure 52 inches with 14 spokes while the front wheels span 44 inches with 12 spokes. 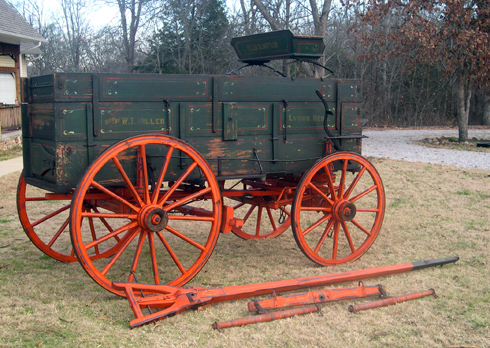 This 3 ¼ inch cast skein wagon featured a cataloged load capacity of two tons and weighs approximately 1,200 pounds. The triple box measures 10 feet 6 inches in length by 38 inches wide and 35 inches deep (14 inch lower box, 12 inch top box and 9 inch tip top box). Additional accessories include a footboard, front/rear box tighteners, brake hanger clips and a folding endgate. 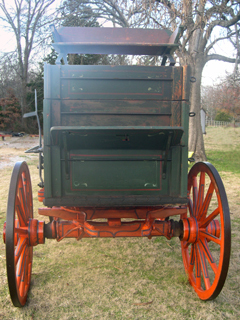 Over the years, this wagon has seen very little use; hence even the faces of the brake blocks still show the majority of their original paint. 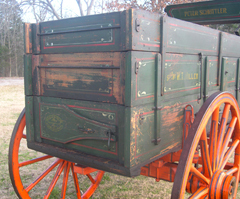 The box and gear are equally well preserved with a few areas on the box showing some paint deterioration. Wood edges, from box to wheel felloes, are largely crisp and very clean-edged. 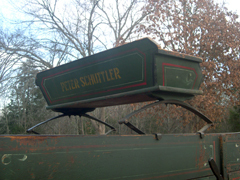 The axles, bolsters and wheels still hold Schuttler’s original technical stenciling and, remarkably, even the original wires that held the manufacturers’ tags are still on the front and rear bolster braces. 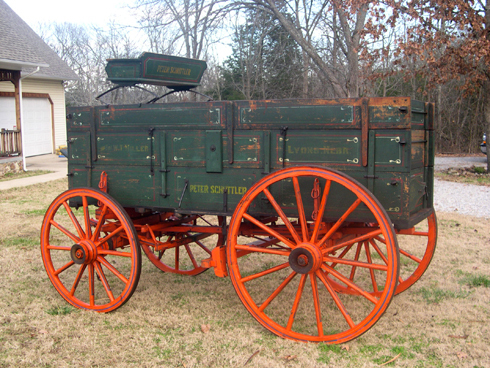 Combined with the original tongue, tongue bolt, stay chains, spring seat, doubletree and singletrees, this is a rare surviving example of a premium Schuttler wagon.